A Guest Post by Tanya Blackiston of A Yarn Loving Mama. When our blog host Sarah emailed to say she was going on holiday and asked would I like to write a guest post for Spinning Show & Tell, I jumped at the chance ... not only because it sounded like it would be a lot of fun to write a post for someone else’s blog instead of my own ... but because I decided straight away that I would attempt something outside of my comfort zone for the project. I have been spinning since 2009 and have, to date, focused on the attainment of a good conventional and functional yarn. I have been mostly stuck in 2-ply Yarn Land, practicing a variety of yarn weights and using a variety of animal fibers. There is absolutely nothing wrong with a perpetual desire to spin the most even and perfect skein of yarn, but after completing 2-ply skein number 11 at the close of the Tour de Fleece last month, I made a personal and conscious decision to try something new. Good old eBay provided me with the raw materials for the project, which on this occasion was 100g of scoured Wensleydale locks, and 100g of Wensleydale top. I began by spinning the whole 100g top as a singles yarn in my usual way. The following evening, I prepared the locks by separating each one from the main bulk of fiber and laid them on my lap ready to incorporate into my spun singles. Then I was ready to begin the plying. By the time the bobbin was full to capacity, I was feeling very jaded from a high level of sustained and complete concentration, so I left it where it was and called it a night. First thing in the morning, I was excited to wind the yarn onto a niddy noddy and inspect my work. So far so good. I really liked what I saw, but my fibery transformation wasn’t over yet. On to the dye job! Using a nice kitchen (and child) friendly blend of food colour gels, I set to work adding permanent colour to my yarn. After cooking on the hob for a while, the heat was turned off and the pot left to cool for a few hours. 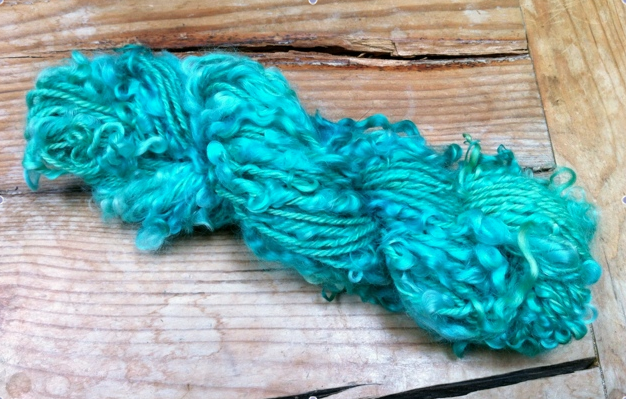 And then the exciting part ... the wash, rinse, dry ... and finally the joyful re-skeining and TA-DAH moment ... A beautiful OOAK hand-spun ‘art yarn’ in a luscious array of bluey-greens and teals. I am immensely happy with how this yarn has turned out, in so much as I had an idea of how I wanted this yarn to look in my best case scenario imagination, and I’m pleasantly surprised by the fruits of my labour. Will I use this yarn as yarn? ... Maybe. Will I admire it, have it out on show and stroke it a whole lot? ... Oh yes! So I guess that what I’m saying is that there’s no need to fear spinning, in any of its guises. If you are spinning-curious then you can look to purchase a drop spindle spinning kit and get started creating your very own yarn. And if you have already started this wonderful craft and are feeling the need to progress on to different methods, I’d say GO FOR IT. I wholeheartedly recommend that if you admire a certain look, texture or colour of yarn, then go out and make it happen ... fearlessly. Play with different fibers ... animal, vegetable and synthetic ... research different ways of creating yarns in a variety of textures, colours and sizes. 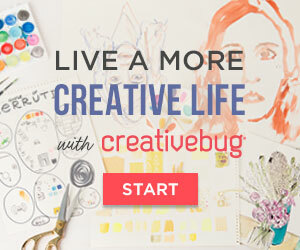 I can assure you it’s a whole lot of fun, with a heaped tablespoon of creative satisfaction on the top. If you would like to read a more in-depth ‘how-to’ write up of this spinning project, please go along to my blog for a read. Many thanks, Tanya. 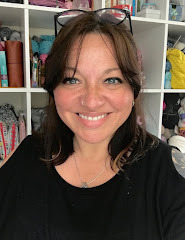 Tanya Blackiston is a lover of all things yarn & fiber, Drop Spindle maker, Spinner, Knitter, Dyer, Crocheter, Mama to one little boy, Partner to one Furniture Maker, and living in Hampshire, UK. Please visit her Etsy Shop, Blog and many other online sites (with username ‘ayarnlovingmama’) including Instagram, Facebook, Ravelry, Twitter, Pinterest and more. What a gorgeous finished yarn! Thanks for the reminder of how exciting it can be to try something outside of your comfort zone. I like how you're so gung ho and down-to-earth. Such pretty yarn you've spun up. I love your art yarn! I'm still trying to master the simple two-ply and marveling at how pretty a neatly-wrapped Turkish spindle looks.